The clear choice for luggage on your Africa Twin is the Zega Pro pannier system from Touratech. 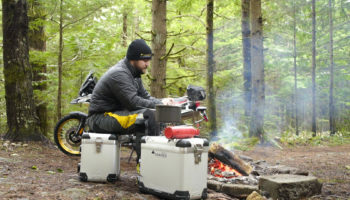 With countless miles of on and off-road touring and testing under their belts, the desgners and engineers at Touratech have created the most robust, functional and attractive motorcycle luggage system on the market. All Touratech panniers have a deep groove aluminum interface with silicone seal. This provides dust proof and waterproof storage even in driving rain and water crossings. Some pannier makers cut corners with a plastic interface between the lid and box. This creates a weak link and often results in breakage and water intrusion.